On top of the giant meal I ate today I just wolfed down a giant hamburger made from ground chuck. The toppings were mortgage lifter sweet onion and sweet relish. The buns were toasted swimming in butter till brown both sides. The bottom bun had sandwich pal horse radish sauce on it the top mayonnaise. $%^& this thread reminds me I need to eat - too often. Today, I got the third coat of paint on the master bedroom walls and ceiling, put down some carpet, moved the bed frame in, fixed the lighting problem - it turns out that the breaker wasn't seated well enough, and got rid of a hidden wall plug that has bothered me for years. (The plug was hidden because our bed was in the way.) ...safety hazard. It looks like a new room all white and spacious. Tomorrow, I need to install a full length mirror, move the box springs and mattress back in, and Jan's bedside table, lamp, and alarming clock. The chest of drawers both need cleaning and repainting attention, but that can wait a few days. I almost forgot about eating tomorrow. At first I read that as install a full length mirror above the box springs. That's okay, I wrote pork fajita meat when it is beef ... oops. I got more accomplished yesterday than I have in a long-long time. My body is telling me all about it today. I didn't wake up until 8:30am in a room with 7 windows in it and it's clear and sunny. got rid of a hidden wall plug that has bothered me for years. (The plug was hidden because our bed was in the way.) ...safety hazard. I presume you mean that you removed the fixture and capped the wires. For the future and the lurkers there are two easier ways to deal with outlets you can't get to. One is to insert plastic child-proofing plugs. The other is to use one of the (relatively) new-fangled flat, right-angle extension cords and pull the end out to where you could reach it if need be. They protrude less that 1/4" at the outlet and put no stress on the wire. Now go eat something cheap. And if you survive that marinade, let us know how it tastes. One very long word for Sunday brunch, kartoffelpuffer. I forgot all about them until I had left over mashed potatoes from yesterday. What I use is the mashed potatoes flour baking powder and egg. Mix in the egg and enough flour some baking powder to make the potatoes stiff like a dough. I had some left over cotto salami so I chopped that up and added it too. Cook on a skillet with some oil I used beef tallow. Or you can bake in the oven. Takes a little bit to perfect or get the way you like them but darn well worth it. If you dont use enough flour they will just fall apart. This is why you cant follow the recipes you see to the tee it wont work because Not all potatoes are the same and some have more moisture in them than others. You should be able to make a ball out of the mix in your hand and by all means let the gluten activate. These are not what we call hash browns. Mine rise up like fry bread and hold together and you cant find a pictuer of them on the web or at least not many. If you done want them to rise up as much use less baking powder. 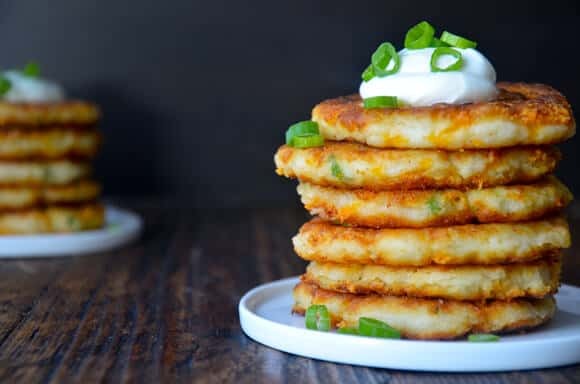 Or you can look up mashed potato pancake and find pictures. Serve with hot spicy dill pickles. Here are some that look like mine just a little thinner. Your imagination is the only limit to these very cheap and easy to make treats and what you can put in them or on top. Worth, I don't know where you come up with these recipes. I guess you could add some shredded cheese to those dinglehoffers? I take what is available and rework it to my liking. Yes you can put cheese in them I would suggest a hard to real hard cheese. Kartoffle is potato in German. It isn't that simple but it will keep me from going hungry if I get stuck in Germany. Pulled my leeks from the garden a few days ago so decided it was time to use some of them. How was it? To my knowledge I have never tasted leeks. I LOVE using and experimenting with spices, herbs, and other flavorings of the world. I also enjoy studying the processes of how they are prepared before they go into a dish. Dry, pre-roasted, made into oil based pastes, or stocks; it's all good! The various types of flavorings of the world fascinate me. I wish there were something like a cookbook/encyclopedia on each and every one, including the liquid additives such as fish sauces, soy sauce etc.. Seems every country and region has something unique and different .........like real chicken paprikash. Ever seen anything like a book that is even similar? I don't know, it's for dinner tonight. I love leeks, I make a leek and potato soup all the time but wanted to try something else with them. We went to Sam's Club last weekend and picked up some mushrooms and wanted to use them up. I found this frittata recipe and it looked good to try out. I've cleaned and chopped the leeks and cleaned and sliced the mushrooms. All I have to do later is finish it out and bake it. Can't figure out what I want to serve with it as of yet though. Ok, sorry. I didn't realize it hadn't been eaten yet. I look forward to hear how it turns out. "Seems every country and region has something unique and different .........like real chicken paprikash. Ever seen anything like a book that is even similar?" all good reviews on Amazon. massive stalks last year but did not know the variety or knew what to do with it. Win-win, he gave them to me. The big green tops make great stock! lobster rolls last night, night before had a 'boil-up'. Cheap eats because they are free. Mussels, Cod, and scallops are free from the sea so lots of that. Haddock for dinner. Free if you don't count license, fuel, tackle, insurance, boat, dockage, and bait.